80th birthday poems: As old as it sounds, turning eighty is a lovely milestone if someone is in good health. It is a vantage point from where people can look at how their lives turned out after all the decades. Whether it is your grandfather, grandma, dad, mother, uncle or aunt – do your bit to make them feel loved on their eightieth birthday. Visit them, spend some time with them and give them a reason to smile. Better yet, bring them home and gather the entire family including their children, grandkids and siblings. 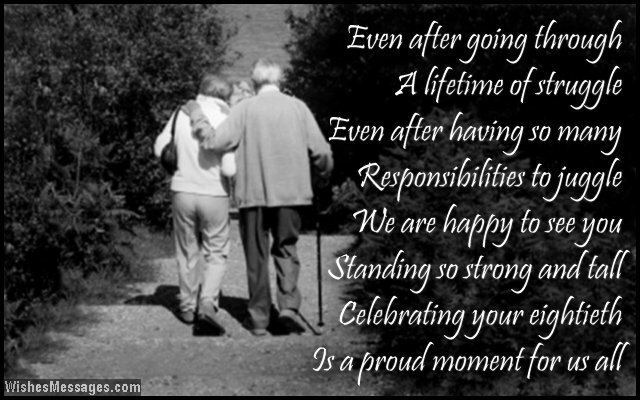 Make it a celebration that is a befitting mark of the sunset phase of their lives. Top your celebration off by writing a touching quote or a message on a birthday card which you also use in a speech while raising a toast to the octogenarian.